During my trip to Vegas a few weeks back, I was had some of the best creme brulee. I’m usually not fond of creme brulee, because 1) I’ve never really had great tasting creme brulee before and 2) there’s no chocolate in it & I tend to not order non-chocolate desserts (that’s just the chocoholic in me). But, the creme brulee I tried in Vegas made me see creme brulee in a new light and see how versatile and delicious it could be. The creme brulee dessert I tried, was a duo of creme brulee, one was classic vanilla and the other was deep chocolate. I was surprised to see a chocolate creme brulee, this was new to me and boy was I excited. So, now I’m sort of in my creme brulee phase and craving it more than ever. 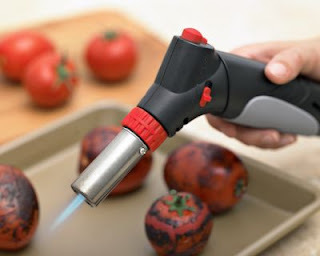 I’m in the process of looking for a creme brulee torch, so that I can whip it up in my kitchen, but I’m stuck on whether I should invest my money into an expensive professional one or just get one of those dinky creme brulee torch sets. Bed Bath and Beyond, sells a creme brulee torch set that comes with a torch and 4 ramikins for $19.99. This sounds much more tempting than the Williams Sonoma torch for $39.95 which sadly comes with nothing else. Oh, decisions decisions. Pros: $19.99 and I can use the 20% off coupon. Sweet!